Transportation engineers like to solve traffic problems using engineering solutions, meaning building things out of concrete and steel. That’s in their training and in their nature. In general, they prefer the “hard” approach of physical structures to “soft” solutions based on psychology and subtleties of human behavior. In the US, for the past 50 years or so, that approach has worked well, thanks to two factors: flush transportation budgets with plenty of room for expensive construction, and policy that equated “transportation” with “motor vehicles.” There’s psychology involved in engineering roadways for cars, to be sure; but cars are hard objects and they respond well to hard solutions. So when roads intersect, the natural engineering response is to want to separate them vertically, eliminating both “delay” and any chance of T-bone crashes. When roads intersect bike-ped paths, engineers want to physically separate the cars from the people. Thus are born underpasses and bridges. This separation of modes dates to the early stages of Modernist planning philosophy. Pedestrian underpasses were built in an early “Garden City,” Radburn, NJ, tellingly dubbed the “Town for the Motor Age.” Subsequent suburban developments across the country, inspired by Modernist ideas, also built underpasses or bridges, often with stairs or ramps to get people from their natural ground level to a level where they wouldn’t interfere with the roads. Which brings us to the doctrine of “separate but equal,” which was used for decades to justify separate and unequal facilities for whites and blacks. The analogy only goes so far—there’s a categorical difference between unequal treatment based on skin color and unequal treatment based on modal choice—but, within its limits, it’s instructive. At any grade-separated crossing, cars go nice and straight, staying pretty much at ground level. People, whether as pedestrians or bicyclists, go up or down stairs or ramps, and around loops or curlicues. Cars get to go fast; people are hidden below ground or up high. The engineers justify this in terms of cost—it’s cheaper to build a big ramping loop for bikes than for cars—but that doesn’t change the fact that the treatment is unequal. Underpasses and bridges disengage pedestrians from the urban sphere, and hide them from the view of motorists. They are appropriate in certain circumstances, such as where an interurban path crosses an interstate highway, and also along greenway corridors, where path users are already intentionally disconnected from the city around them. But where they’re used just to get non-motorists across a city street, they are symptomatic of a less-than-wholehearted embrace of multimodalism, a clinging to the failed precepts of Modernism. The engineer may object that there’s no safe way for pedestrians to cross a high-speed road in the city, but the real question should be: what is a high-speed road doing in the city? Moreover, the enormous cost of an underpass, in a time of declining transportation budgets, means forgoing lots of other, cheaper facilities. 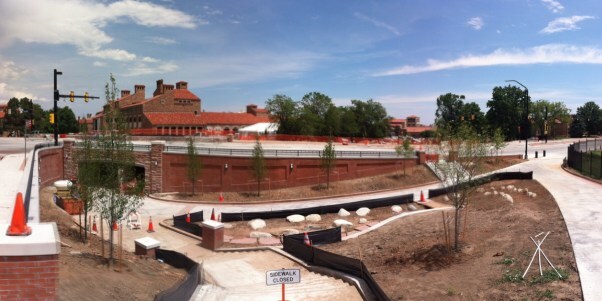 Boulder is in the midst of constructing an underpass costing $3-4 million, as part of a larger $7.4 million project. That much money could build a lot of sidewalks, refurbish a lot of bus shelters, plant a lot of street trees. The better alternatives to grade-separated crossings are traffic-calming, road diets, reconnecting the street grid, allowing full movement at every intersection, and putting sidewalks on every street. The Town for the Motor Age ushered in underpasses as a transportation tool; Cities for People deprecates them. The contrast is stark, and the conclusion is clear: though underpasses and bridges are nominally for pedestrians and bikes, their design comes out of an auto-oriented Modernist mindset. They are separate, but not equal, and urban design is best served by changing that mindset.